Christilot Hanson-Boylen born in Djakarta, Indonesia, is a Canadian equestrian who competed as a member of the Canadian Equestrian Team in Dressage at six Olympics (1964, 1968, 1972, 1976, 1984, and 1992). 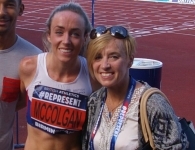 She earned individual gold medals at the 1971, 1975 and 1987 Pan American Games, making her the only athlete to achieve three individual gold medals in Pan Am history. In addition, she has been a Canadian National Dressage Champion seven times. At the Summer Olympics, her best performance was in 1976, when she came seventh in the individual competition and fifth in the team event. She was also the highest placed North American rider at the 1984 Olympics in the individual dressage when she came tenth. Christilot has written two books and produced a video about dressage and is one of the founders of the non-profit Canadian Dressage Owners and Riders Association. Can you tell us about your sporting background and what inspired you to take up horse riding as a young girl? I always wanted to work with horses and ride,although my family had no history or background with horses. I was always totally sure it was what I wanted to do…although at age 10 I had not picked “dressage” as my discipline. You are an incredible 7 time Olympian for Canada in Dressage, can you tell us about your Olympic experience and what kept you motivated to continue to strive towards 7 of them? I never strove for Olympics…I loved riding and training and competing, and if I had the right horse at the right time, we went to the Olympics! Can you tell us about your coaching role within dressage and what was involved in gaining any qualifications? I was one of the few Canadians back in the 70’s who went to Germany for extended periods of time for dressage training. I was also instrumental in setting up a grass roots organisation called CADORA to further good basics in dressage in Canada. Somewhere down the road Equine Canada saw fit to award me my Coaching credentials. Who is harder to train, the horse or the rider? What is the situation like with regards to female coaches, leaders and trainers in your sport? Since this is one of the few sports where men and women compete together, there is no overwhelming dominance of men…particularly in North America. In Europe there is still a predominance of men in professional coaching or training positions. What traits do you think a woman has to have to be able to reach elite levels in sport? What she needs to be elite in any sport…Physical ability and athleticism – determination – drive – inherent coordination – positive competitiveness – a love of the horse – a feel for animals in general. What are your future ambitions within dressage? To give back to Canadian Dressage, and Dressage in General – I have enjoyed so much for so long in this sport community…from meeting the breeders of the horses, to young riders, and I was blessed to train with some of the dressage legends of the past.